This 4 Days Mgahinga National park Uganda gorilla safari and golden monkey trekking safari Uganda takes you to the smallest gorilla park with one of the most beautiful scenery in Africa. The park covers an area of about 33.7 km² driving over 493 km²; about 9 hours’ drive from Kampala using the Kabale-Mbarara-Masaka road. Mgahinga National Park is home to the Nyakagezi gorilla group that is open to tourists on Uganda gorilla safaris and is strategically situated in the extreme corner of the country, forming part of a large conservation area that straddles the boarders of Rwanda and Congo. In these 4 days tour, you visit Mgahinga national park to track the rare and endangered mountain gorillas. Being located in the Virunga Mountains, the park is connected with Volcanoes National Park in Rwanda and the Virunga National Park in the Democratic Republic of the Congo. Day 1 of the 4 Days Mgahinga National Park -Uganda gorilla safari and Golden monkey trekking safari Uganda: Transfer from Kampala to Mgahinga National Park. 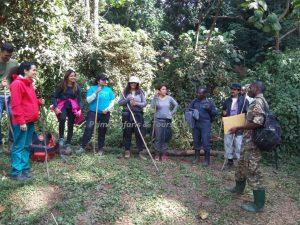 Day 2 of the 4 Days Mgahinga National Park -Uganda gorilla safari and Golden monkey trekking safari Uganda: Do gorilla trekking and community walk. Day 1: Transfer from Kampala to Mgahinga National Park. You are required to wake up early and start your journey to Mgahinga National Park Uganda. your Uganda safari guide will pick you up at your hotel early in the morning at around 6am, he will give you a short briefing about your 4 Days Uganda wildlife tour. You will then leave Kampala and drive south west to Kisoro with en route at the Equator and lunch in Mbarara Town. While at the Equator, you will have chance to step in two hemispheres at the same time, do a polar water experiment, tour the souvenir shops around and take photographs as well. Embark on your journey to Mbarara for lunch and then proceed to Mgahinga National Park. You will enjoy the beautiful scenery as you sit back and admire the Kigezi highlands, the sloppy terraces of Kisoro, thousands of plantations on the road side, views of the Virunga ranges and various lakes. Upon arrival, you will check in your accommodation, have dinner and relax for the next day. You will wake up early in the morning and take breakfast at your hotel/lodge, get your lunch packed. 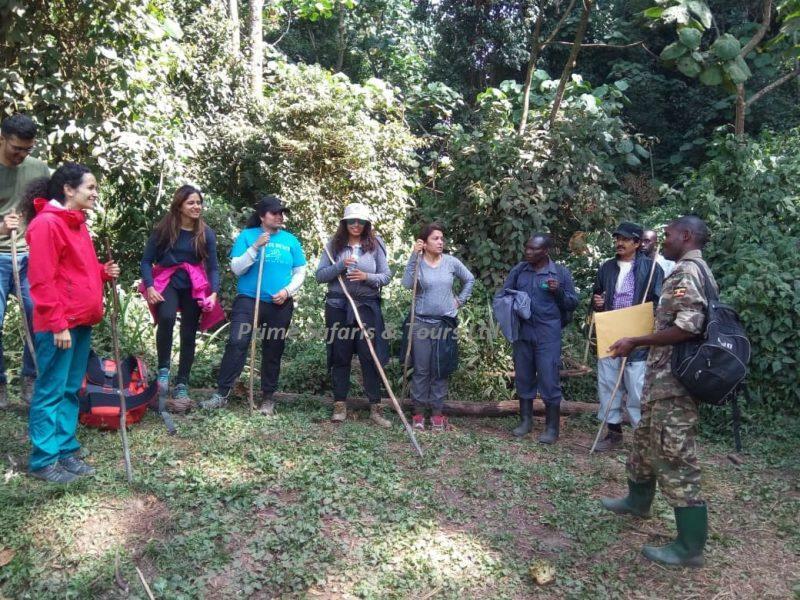 The Uganda gorilla trekking safari activity starts at 8am. Your driver guide will pick you up at your lodge and drive you to the park headquarters for briefing about your gorilla safari Uganda especially about the do’s and the don’ts of the gorilla trekking activity. You will then be led into the forest by the pack rangers in search for the gorillas. Upon sighting them, you will be restricted to an hour with them. In this hour, you will have an opportunity to watch them feed, play, build their nests, shy away from you which gives you an opportunity to photograph each moment that catches your eye. After the activity, you may decide to rest at the lodge or do a community walk around in the Batwa communities where you will enjoy their cultural dance and drama. Wake up early in the morning and organize for this day. Your driver guide will pick you up at your lodge and take you to the park headquarters where the activity starts from. Golden monkey trekking safaris Uganda begin at 8am. Go for a least stressing hike on Gahinga which also offers a chance of spotting golden monkeys and forest birds. You can hike Mount Gahinga which takes about 9hours, a mountain after which the park was named. It is about 3,474m tall. Have a relaxed breakfast and drive back to Kampala with en route for lunch in Mbarara. You may decide to fly back to Entebbe if you don’t want to drive the long journey again. We shall be pleased to organize for your flight.